Kinmount House stands in an extensive landscaped estate. The present house dates from 1815 and the loch from about 1820. The woodland on three sides of the parkland is older with the oldest oaks dated to c 1630 and other plantings from between 1780-1800. Ornamental conifers date from c 1900. We were grateful to Hoddam and Kinmount Estate for permission to access the grounds. Six of us gathered by the fishing loch across the A75 and walked through the main gate. We recorded in parts of 3 monads. Most time was spent in NY1468 which has all the lower loch and half the upper loch. The site has a good number of long established ornamentals which we did our best to record. The woodlands would clearly be more interesting earlier in the year but did give us Wood Sedge Carex sylvatica and Remote Sedge C. remota indicating their long history. There were plenty of ornamental trees to puzzle over. 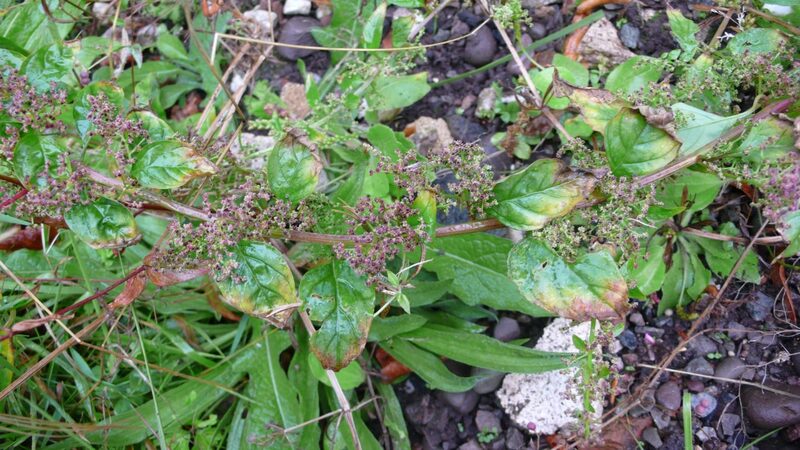 The first surprise was finding Many-seeded goosefoot Chenopodium polyspermum on a pile of dumped stone and soil. I have recorded this twice in Nithsdale but never in Annandale so this is the third record for Dumfriesshire since 2013. This is common in the midlands and south of England and may be moving north. 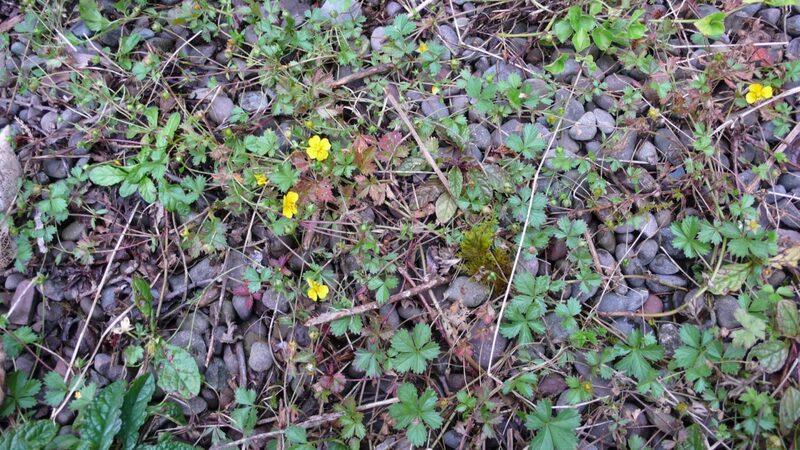 Another interesting plant on gravel by the loch was Trailing Tormentil Potentilla anglica. This is something that has not been recorded in Dumfriesshire since 1999. It is recognised by having leaves with a mix of 3/4/5 leaflets, petioles of variable length and flowers with 4 and 5 petals. It differs from Creeping Cinquefoil Potentilla reptans which we recorded along the drive which only has leaves with 5 leaflets and flowers with 5 petals and from the much commoner Tormentil Potentilla erecta which only has 3 near stalkless leaflets and 4 petaled flowers. The open water of the lochs themselves were dominated by White Water Lily Nyphaea alba but only one pondweed was seen Fennel Pondweed Potamogeton pectinatus. There was a richer assemblage around the edge of the lochs. Native species included good stands of Water-plantain Alisma plantago-aquatica, Lesser Pond-sedge Carex acutiformis, Water Horsetail Equisetum fluviatile, Branched Bur-reed Sparganium emersum and Unbranched Bur-reed S. erectum, Bulrush Typha latifolia Hemlock Water-dropwort Oenanthe crocata, Gypsywort Lycopus europaeus and Skullcap Scutellaria galericulata. 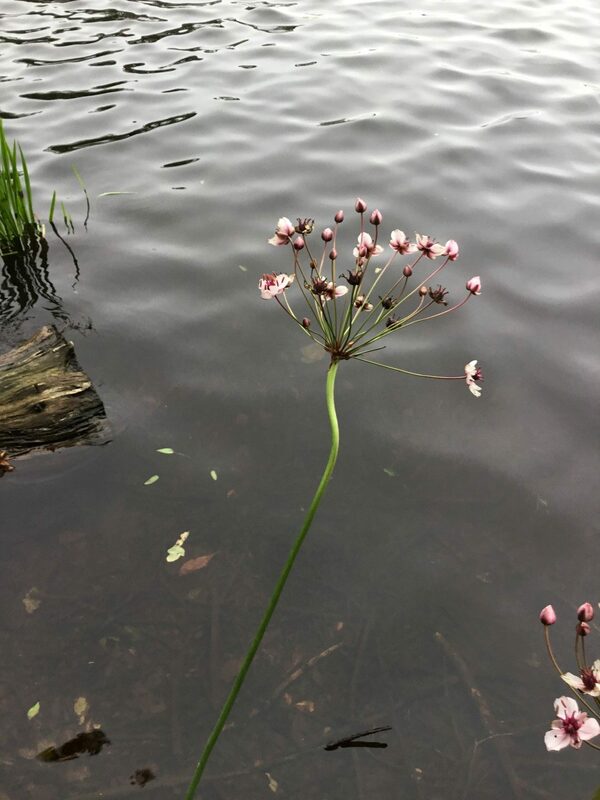 The most spectacular non-native around the lochs was Flowering-rush Butomus umbellatus (though it is not a rush of course). There are only 3 previous records for this in Dumfriesshire, 2 from this site. At the top of the upper loch where we had lunch there is a good sized sedge bed dominated by Lesser Pond-sedge but also with large tussocks of Greater Tussock Sedge Carex paniculata. This also had some spectacular non-native plants like Yellow Oxeye Telekia speciosa and Rodgersia Rodgersia podophylla.